Are you starting to think about Christmas gifts yet? Consider giving the gift of Paper Pumpkin. Paper Pumpkin is a monthly craft kit that comes in the mail. It has an exclusive stamp set and project. Paper pumpkin is on special this month. If you are a new subscriber, use the promo code BOGO and you'll pay $26.95 for the Oct kit and your November kit is FREE. 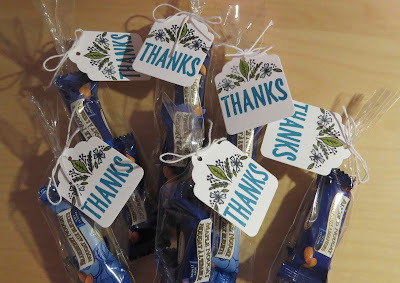 I used the August paper pumpkin kit to make tags for my thank you treats. Isn't the stamp set pretty?